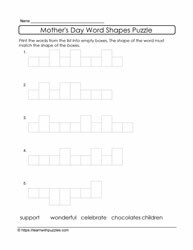 How do puzzles support students in the classroom? 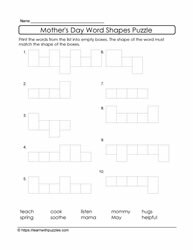 Students love solving puzzles and when combining the brain teaser with the very special day during the school year, Mother's Day, it's sure to be a hit with kids! 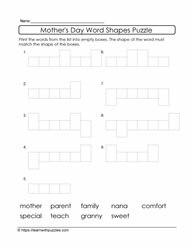 Word shape puzzles support consolidation of spelling of Mother's Day related words. 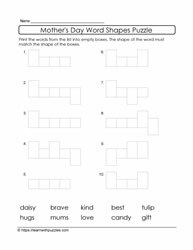 To solve the brain teaser, students need to compare the list of words with the word shapes in the puzzles. 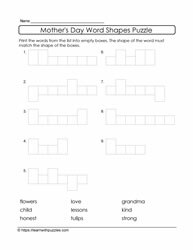 Words to describe mom can be adjectives, verbs, or types of gifts you give mom on her special day. Nouns like: mother, daughter, ma, grandmother, mom, granny, nana.